(Reuters) - A 22-year-old woman was arrested Wednesday night for illegally transferring a handgun used by a white supremacist parolee linked to the shooting death of Colorado's prison chief, authorities said. Stevie Marie Vigil of Commerce City, Colorado, was arrested by the Colorado Bureau of Investigation on suspicion that she legally bought the gun and transferred the handgun to Evan Ebel, a convicted felon who was not allowed to legally own firearms, bureau spokeswoman Susan Medina said in a statement. The El Paso County Sheriff's Office said this week that the same gun used by Ebel in a shootout with Texas police was also used in the shooting death of Tom Clements, the executive director of the Colorado Department of Corrections. Clements, 58, was gunned down when he answered the door at his Monument, Colorado, home on March 19. Police have not said if Ebel killed Clements. Ebel, 28, who died in a gun battle with police near Decatur, Texas, last week, is also being looked at in the shooting death of a Denver pizza delivery man two days before the Clements' killing. On Tuesday, police said they found a pizza bag and other Domino's Pizza items in the trunk of Ebel's car. Stevie Vigil allegedly bought the firearm from a licensed dealer in a Denver suburb in early March and transferred the weapon to Ebel, Medina said. Law enforcement sources said Ebel was a member of the 211 Crew, a white supremacist prison gang, and he served several years in prison for a variety of offenses before he was paroled in the Denver area in January. The gun dealer has cooperated with authorities and had no knowledge of Vigil's plan for the gun, police said. Authorities said Vigil's arrest records are sealed, so it is unclear if she had any connection to the 211 Crew. Vigil is being held on a $25,000 bond and faces a maximum of 16 years in prison if convicted. The senate committe working on new gun regs voted on stronger penalities for these kind of "straw purchases". Guess which party 's senators voted against stronger penalties for people who give guns to people who cannot pass a background check. know what you want done..
write to US House , Washington DC 20515 write to US Senate , Washington DC 20510 . There are already federal laws on the books for "straw purchases" but I guess this is the first time the feds decided to charge someone so it has become newsworthy. Good! Anyone who knowningly sells guns to a felon should be locked up. 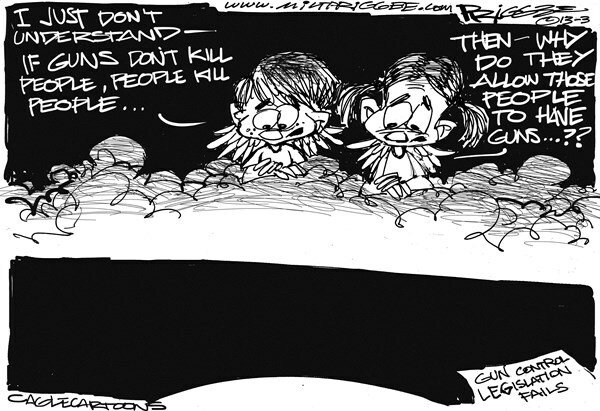 That's one thing gun owners and anti-gun folks agree on.